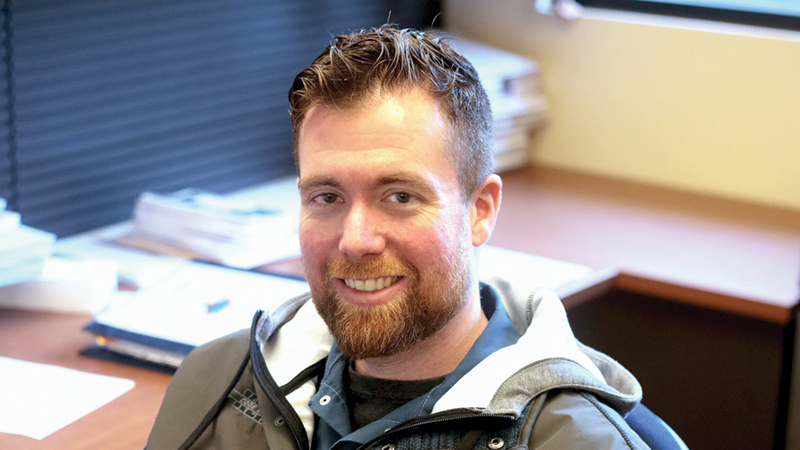 Like many police officers, every situation that Ben Crosby, the code enforcement officer for the City of Keizer, investigates has the potential to go south and get him hurt or killed. What some people do not realize is that when a code enforcement officer goes out to investigate a complaint they do so alone, without a Kevlar vest, gun or Taser. All Crosby has is a ready smile and a well honed set of people skills to keep him safe. “Being able to know your audience, know who you can talk to and how,” Crosby said. It’s a gift and one that he uses every day. “It’s hard to articulate that (know-how and skill) being able to tell someone they are doing something wrong without making them mad and instead making them want to fix the problem, to come up with a solution” but that is what he does. Ben Crosby handles development and police code enforcement for Keizer. Knowing when and how to talk to people comes naturally to Crosby and this makes him a perfect fit for the position. He is Keizer’s first full time code enforcement officer. He has been on the job for three years. “I am excited to be here, to be the first full time code enforcement officer. I like that,” he said. The opportunity to make it his own and build the position from the ground up is still very exciting to him. That said he isn’t new to the job. He has 16 years of security and enforcement work under his belt. Before working for the City of Keizer he worked for the City of Salem where he worked for the Parking Services Division before becoming a code enforcement office. Before that he worked in security for Walmart. Even with all of this experience he has had his share of danger. “I’ve been stabbed. It was when I worked for Walmart Crosby said. His security team also received a commendation for having the most arrests in one year. “I’ve had guns pulled on me. That was while working for the City of Salem,” he said. He was working in code enforcement at the time. He and another officer were conducting a standard inspection on a multi-family dwelling. The landlord had given notice but apparently not everyone read it. As they made their way through the building, Crosby knocked on a door and when no one answered he went into an apartment. He walked out of a room he had just inspected to find approximately 10 gang members, some armed, standing between him and the door out. Thanks to his chutzpah he was able to bluff his way out. “Some people went to jail. Some were told to not threaten city officers.” All of this said with a smile, as if he is telling a story about how he was the victim of a rather funny practical joke. Humor is also part of his tool set. “The scariest thing is the unknown,” Crosby said. He starts his day reading emails and listening to voice mail. “People call and email all day and night long,” he said. Crosby receives approximately 10 complaint calls and 10 -20 emails a day, but this can fluctuate going up or down depending on the time of year. He gets help from several employees in the planning division. Megan Hurley, who is a building permit specialist, is one such person. She does administration work for Crosby. “This department is very customer service oriented. Megan is helping with that,” he said. Hurley takes many of the calls, emails and messages reporting violations. He also gets help from Dina Russell, the assistant planner. She helps out with signage, zoning issues, food cart licensing as well as assisting with some of the admin work. Shane Witham, now senior planner, previously handled code enforcement while juggling his duties as assistant planner. When Crosby needs back up, Witham goes with him or if it looks like it might be a dangerous or difficult call a police officer will go with him. “It really comes down to the team effort. There is so much to do here and we took on a lot more,” he said. This is because other departments see the value of letting code enforcement do the work. Crosby prioritizes all of the complaints he receives each day. It’s his hope that he can make contact within a couple of days. He hopes that a face to face meeting and some education on city code will clear the problem up. He understands that there are times when life can be overwhelming and that people let things slide. Given the volume of work he has to do in an eight hour period, this at times seems impossible but he gets it done. Anything that requires a notice is addressed within the week. All that said he is understanding and tries to help individuals who have complaints lodged against them and who are in violation of city codes. This is his focus and what he likes best about his job. “The ability to help change neighborhood expectations, to get them raised up, to a higher quality of life and livability,” Crosby said. Often complaints stem from a resident not know the neighborhood’s expectation. This is especially in older, established neighborhoods. Crosby finds that rental properties have the large majority of complaints made against them. Most people who live in rental homes do not know what the neighborhood expects of them. He hopes to make a difference, to bridge this gap between expectation and understanding. “I have hope, that the need is there, that the want is there” to solve the problem, he said. While most of the complaints he gets are legitimate, there are some folks who will abuse the system. They usually call about minor issues such as trash cans on the street, parking issues or a bag of trash left sitting out. Once again this is usually a case of neighborhood expectations. Crosby’s answer to is the problem is talk to your neighbors. Crosby’s life is not all code enforcement. He is married and has a family. He met his wife while attending McKay High School and started dating after graduation. “We have a 16 year old daughter and a nine year old son,” he said. The family lives south of Salem on property that was once home to an overgrown Christmas tree farm. They spend their free time cleaning it up. Their goal is to turn the property into an event venue and host weddings and other gatherings there once it has been cleaned up and made ready. “We slowly chip away at it,” he said. Fun time is hiking and camping anywhere near or around Bend and hiking the trails around Detroit Lake.